Summer is the season for embracing and letting your wild side loose because you can’t and won’t be tamed. And this is especially true when you get the chance to break free in an enchanted garden! Deposit as little as $25 and let your inhibitions go in our new Enchanted Garden II slot with up to a 225% Match and 50 Free Spins! With summer in full gear, it’s time for priorities. 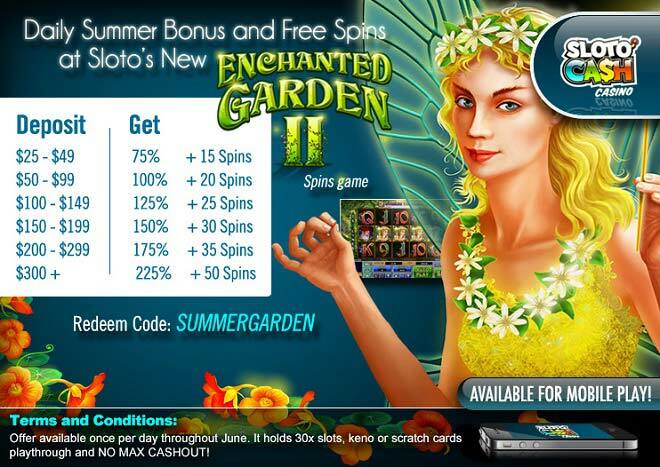 Set your summer goals straight when you spin the 5 reels of Enchanted Garden II where bonus rounds, free spins, multipliers and all kinds of faeries and magical creatures are ready to pack your Sloto account with wins. The time of the year to break free and be truly happy is here and it’s when you can claim a daily bonus of up to 225% with 50 Free Enchanted Garden II Spins!